VJ Salomone Marketing Limited is one Malta’s leading distributors. We are distributors for Procter & Gamble, the largest fast moving goods company globally. 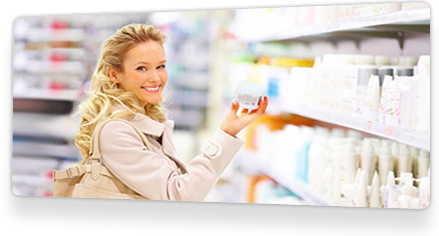 We market the largest line-up of household brands and trade in major categories from home care to baby care, personal care to snacks as well as health care. In 2011 we will celebrate 80 years of successful partnership with Procter & Gamble. For many years we have always placed the consumer at the heart of our business strategy. We will strive to continue delighting our consumers and shoppers for the many years to come. We are proud to be part of the P&G family that improves consumer’s lives in meaningful ways every day by delivering brands of superior performance, quality and value. On the 26th November Victor J. Salomone is born to Solicitor Alberto Salomone and Maria Anna Fiteni. In 1923 he graduated as a pharmacist and afterwards as a dental surgeon. Later his entrepreneurial spirit led him to give up his well established professional practice and venture into business trading under the company name The British Import Co.
Start of the business relationship with Procter and Gamble. V.J. Salomone represented Thomas Hedley and Sons, then a small British soap firm (manufacturer of the Fairy brand). Procter and Gamble’s objective was to expand into Europe and the Thomas Hedley and Sons was identified as the vehicle to do so. Expansion is pursued and V.J.S ventures into the importation and distribution of Pharmaceuticals with the representation of SAndoz Ltd., Basle. A Distributor’s Agreement was signed between The British Import Company, Valletta, Malta and Procter & Gamble A.G., Lucerne, Switzerland. Products covered by the Agreement were: Tide, Cheer, Daz, Dreft, Flash, Mirro, Fairy Soap, Fairy Snow, Fairy Liquid, Camay, Drene, Sweetex, Hedlex, Suncup, Ivory Soap, Crisco, Fluffo, Big Top Peanut Butter, Jif Peanut Butter and Duncan Hines. Victor Joseph Salomone transfers two-thirds ownership of the business to his 2 sons Albert V. Salomone and Antoine A. Salomone and changes the name of the company to V.J. Salomone & Sons. Tide Bar and Tide laundry detergent were introduced. Known also as the “washing miracle” with its formula that cleaned better than anything currently on the market, Tide was an instant success. Victor Joseph Salomone transfers his remaining one-third ownership of the business to his son-in-law Anthony A. Galea and retires from business. The Company changes its name to V.J.SALOMONE LTD.
P&G used Malta as a test market for U.S. brands: Secret, Ivory, Safeguard, Scope and Crest (the first toothpaste with fluoride clinically proven to fight cavities). In the same year V. J. Salomone introduced the concept of door-to-door selling. The Company introduces the Tide super Gift Scheme. Consumers collect wrappers of P&G products and exchange them for gifts at a specially set up centre in Valletta. The Government of Malta introduces an Import – Substitution Trade Policy to protect local industry. The business of VJS is restricted to the importation of few products. The Organisation goes through difficult times. V.J. Salomone transfers operations from Valletta to new offices and warehouses in MARSA. To survive, V.J. Salomone had made a choice to diversify its business. The risk paid off as the Company had continued to grow despite the hard economic realities. A newly elected Government announces its intention to liberalise importation. VJS re-launches a number of leading P&G brands such as Ariel, Fairy, Camay, Crest and Head & Shoulders. P&G consolidates its acquisitions within the V.J. Salomone Organisation. V.J. Salomone starts distribution of VS Wash &Go with its 2-in-1 technology. Wash & Go quickly becomes the leading shampoo in Malta. V.J. Salomone also starts distribution of Pantene hair tonic. V.J. Salomone starts distribution for Richardson-Vicks. P&G maps out a Special Business Building Plan for Pampers and starts to spend heavily behind the brand. V.J. Salomone enters the feminine protection category with the launch of Always. Always is sampled to 50,000 households. 100,000 households are also sampled with Pantene 2-in-1. The 1st Pampers Redemption Scheme takes place and stores participate in an in-store Ariel display competition. In the same year V.J. Salomone re-structures and transfers the P&G business to British Import Co. Ltd. The acquisition of Shulton’s Old Spice as well as the acquisition of Max Factor and Eurocos owners of the Boss and Biagiotti brands. V.J. Salomone enters the cosmetics and fragrance category. Launch of “The Summer Big Lottery” with the Grand prize being a Fletcher Speedboat. Monthly prizes include a power-driven Dingy, Windsurfers and mountain bikes. In the same year, after negotiations with the National Education Department, V.J. Salomone launches the Always School Programme in all public and private secondary schools. V.J. Salomone launches Pringles; an instant success. V.J. Salomone starts distribution of the Tampax brand and consolidates its market position in the feminine protection segment. Launch of Pampers Baby Club. Members of this club are regularly provided with information on child development and exclusive offers. This loyalty scheme continues to grow in popularity. V.J. Salomone Marketing participates in a Worldwide Quality Assurance Advisory Audit and scores highly. In June, V.J .Salomone Marketing launches the Ariel Washing Machine Promotion. 20 Washing machines are made available to leading stores for them to raffle in their outlets. Each participating store donates a promotion area to display Ariel products. In October, 12 retailers visit P&G in Geneva after achieving targets. The launch of a website www.75.com.mt to commemorate 75 years of Association with P&G. V.J.S Marketing starts distribution of Herbal Essence. The announcement of CSR Campaign “Helping a Child to Live, Learn and Thrive is like Saving the World” intended to raise funds to help underprivileged children in Ethiopia access safe drinking water. In-Store activities kick off during the month of October. P&G incorporates Gillette brands into V.J. Salomone Marketing’s portfolio. Brands include Gillette, Oral B, and Duracell. VJSM launches Gillette Fusion – Gillette’s revolutionary 5-blade technology. Wella consumer brands merged into V.J. Salomone Marketing’s portfolio, enabling the Company to offer a full spectrum of Hair Care Solutions to consumers. Wella expands Wella Koleston range to include Kits. V.J. Salomone Marketing re-launches Crest toothpaste in Malta. V.J. Salomone Marketing and P&G initiate the Pampers & Unicef, one vaccine for every Pampers pack sold. V.J. Salomone Marketing transfers operations to a new 4,000m2 distribution Centre in Handaq. V.J. Salomone Marketing ‘Herbalises’ Malta with the re-launch of Herbal Essences. This is V.J. Salomone Marketing’s biggest launch ever. Olay brand becomes the brand addition to be handled by V.J. Salomone Marketing. Olay’s heritage and brand equity enabled V.J. Salomone Marketing to consolidate its Beauty Business with the re-introduction of Olay. Pampers + Unicef initiative expanded. Outlets endorsed the initiative through pledging of additional vaccines. Ace Laundry detergent range launched as V.J. Salomone Marketing’s third laundry brand after Ariel and Dash. V.J. Salomone Marketing incorporates Clearblue pregnancy tests into its portfolio. A key component of the line-up is Clearblue’s innovative Digital Pregnancy test. Duracell partners with Challenge 8000 – the 1st Maltese team to reach the top of Mount Everest. V.J. Salomone Marketing re-launches the Camay brand, through the introduction of the new shower gel line-up.